A herbal symphony with delicious mint notes and hits of peach and spice. This is an excellent blended tea with cleansing finish. 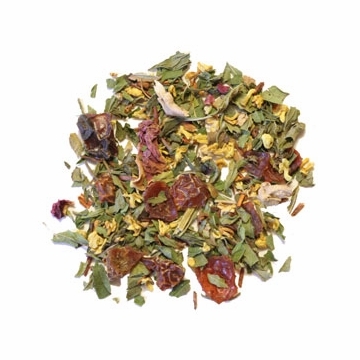 Ingredient: rooibos, peppermint, spearmint, rosehip, ginger, rose, sunflower, calendula, osmanthus petals. We love this tea hot or iced. Kinda Moroccan mint, with a spicy finish..
Have tried various teas throughout the years. "On The Waterfront" is by far my favorite. Refreshing yet relaxing mint with fruity peach undertones. Absolutely love it! I have bought several times and also for gifts. Everyone has complimented on it that has tried it. I think this is a nice mixture of different things that make this tea great. You can definitely tell a mint presence when you smell this tea and obviously when you drink it. Love Love this teat as well. Just like surfing in a cup!!! The mystic blend of mint and flowers sends my souls a reeling.. I brew a large batch of "On The Water Front" and keep it in the refrigerator because it is great hot or cold!!! Also seems to help with my seasonal allergies, clears my head up... Thanks EnjoyingTea.com for another great product!!! I thought this blend of tea was quite good. The main note is mint which I like very much. I would probably buy this again. This tea was actually something a friend got as a sample and then purchased because she loved it so much. She then shared it with us. It is refreshing and yummy. A refreshing mint tea - great as iced tea!